Manufacturer & Exporter of Zero Ohm Resistors. Our product range also comprises of Film Resistors, Wire Wound Resistors and High Voltage Resistors. Focused on the optimum satisfaction of our valued patrons, we are offering superior quality Zero Ohm Resistors to our valued patrons. These resistors are manufactured by our team of dexterous professionals using authentic raw material sourced from certified suppliers. Optimum use of modern tools and technology ensure high efficiency of these resistors. 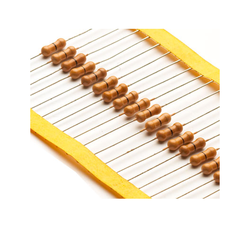 Customers can avail these qualitative resistors from us at market-leading prices. Customization facility is also available. Looking for Zero Ohm Resistors ?